Matt Talbert is a contemporary oil painter living in Orange County, California. He is named one of the "Top 100 Figurative Artist Working Now" by PoetsArtists Magazine. Matt's primary focus is expressive paintings of the human figure exhibited in galleries such as Arcadia Contemporary in California. While he grew up at the beach, he attributes much of his artistic development to his years spent in New York City. Working in the basement of the famous Pearl art store on Canal street and meeting a wide range of artists from all disciplines was indispensable. He has recently been featured in the pages of American Art Collector, PoetsArtists and International Artist Magazine. 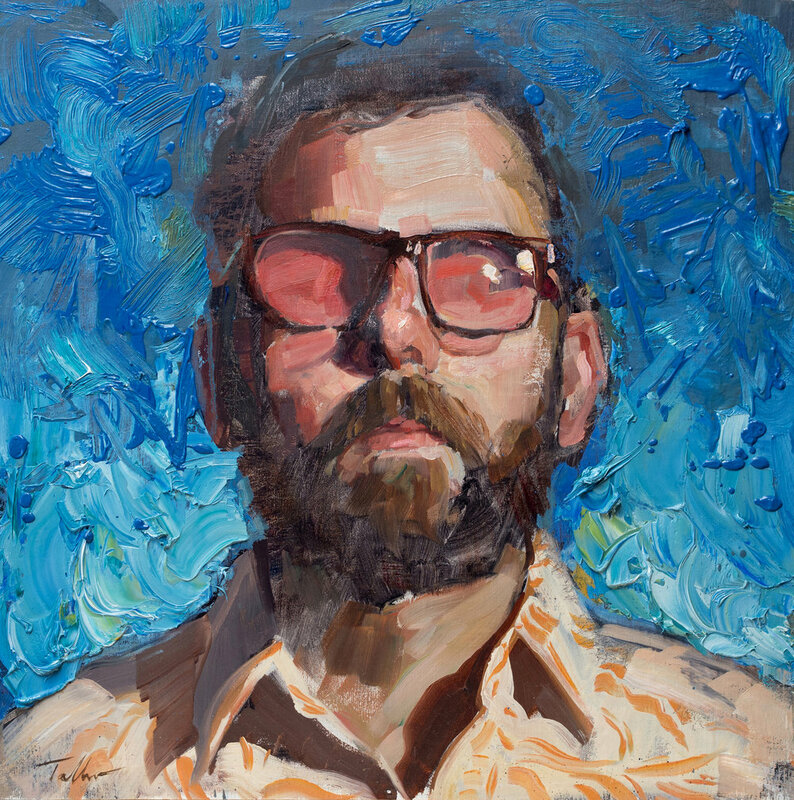 Matt earned his BFA from the Laguna College of Art and Design and is a member of the Portrait Society of America. Desire is a fruitful exercise in restraint and minimalism, in that the tightly cropped and beautifully depicted imagery leaps out from the unpainted background. Thoughtful, well-placed brushstrokes capture an exalted yet fleeting sense of realism while waning impasto and seemingly haphazard drips gradually invade the bare support, enhancing its captivating contemporary look. Talbert’s Hawaiian Daydream is a quintessential example of both his spontaneous approach as well as his expressively poignant artistic delivery. 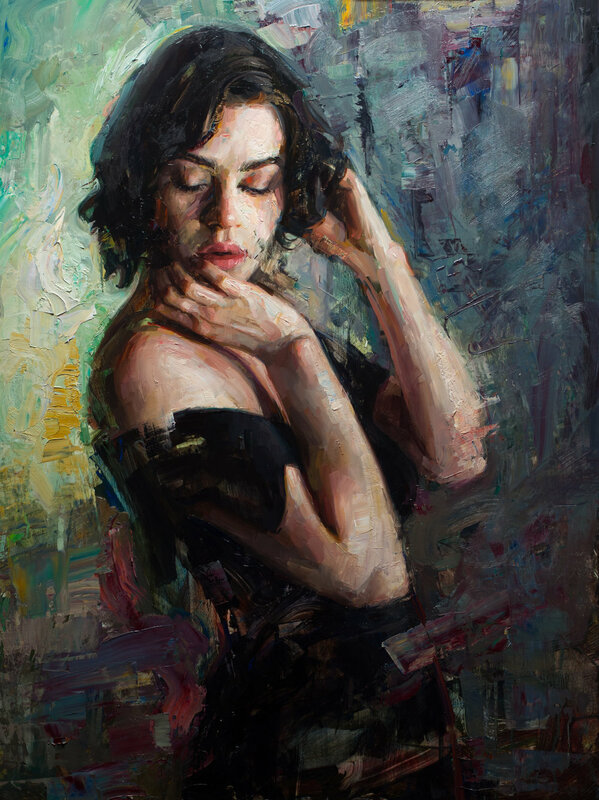 The loose brushwork and delicious impasto give this portrait an elegant, rhythmic movement which is beautifully supported by the analogous color palette. 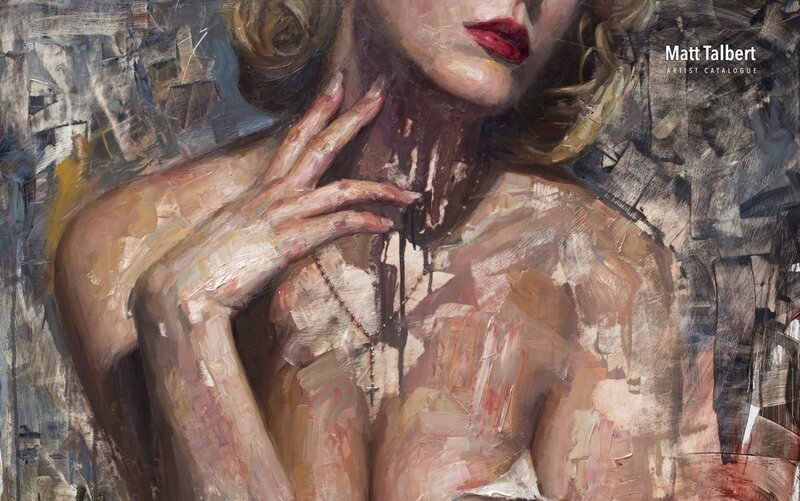 Talbert’s lavish painting, entitled American Beauty, shows a closely cropped female figure in a seductive pose, reminiscent of Marilyn Monroe. 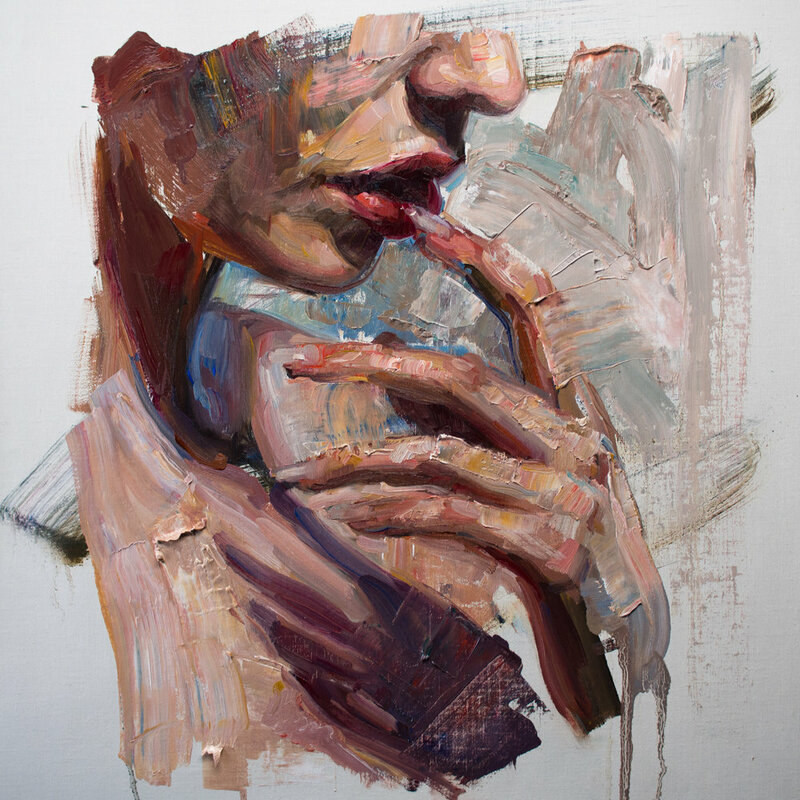 The strength of this piece lies in the chemistry taking place between the smooth face, the painterly limbs, the textural hands, while other areas are hardly painted at all. Symbolizing the fragmentation of American ideals, Talbert defines it as, “A representation of the United States in decline, but as with any transformation there is always the opportunity for something better to emerge from the chaos." The impact of Moonlight lies in its superb handling of chiaroscuro in which, despite the wild brushstrokes and abrasive scrapes, the darkest darks seem to embrace and evolve into the lightest lights. Its realism is profound when looking at it through squinted eyes, yet its beauty truly lies in the intrepid mark-making and exposed notes of vivid color. Talbert’s Nothing to Fear reflects the artist’s anguished state of mind in regards to an unpredictable world that is seemingly spinning out of control. At first glance, the pose, as well as the brushstrokes, reflect intense emotions related to restlessness and concern. Then, looking deeper, we find an allegorical undercurrent that echoes a more spiritual sense of calm that seems to whisper that everything will be alright. Inspired by the stirring shadow play on the model’s back, Talbert not only succeeds in masterfully capturing her confident and alluring over-the-shoulder gaze but also ironically leaves many things unsaid within the subtle drama of a medley of brushstrokes and scrapes that seem to beckon the viewer to take a closer look. Talbert’s piece, entitled Rock Star, is a portrait of a close friend. Expressed in an intense chiaroscuro with lots of shrouded color, her eyes hide behind dark sunglasses in order to create emotional tension, encouraging the viewer to try to discern her gaze and gauge her seemingly distant disposition which is contradicted by the gentle curve of her alluring lips. 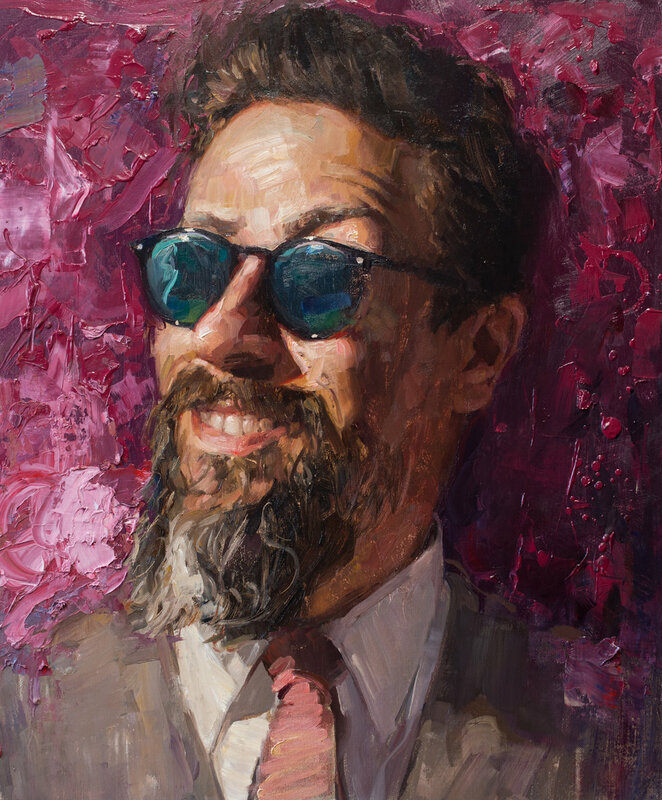 In The Sky is Falling, Talbert portrays a friend with an inane grin on his face, his eyes hidden behind dark shades, with a bright magenta impasto background fiercely elbowing its way into the scene. The alternative and lengthier title given to this painting—Front Row Seat to The End of the World—alludes to current world events and is a commentary on how most people seem to prefer to remain oblivious and passively comatose towards the corrosion of shared ethical and moral values happening all around us. Inspired by the understated yet palpable emotions in his model’s pose, Talbert created The Muse, especially focusing on the elegantly arching interplay between facial and gestural expressions. The rough, colorful impasto of the background elevates the refined delicacy of her features and somehow makes her look simultaneously vulnerable and strong.